It is safe to say that life as a pirate was a very hazardous one prone to serious injury and even death. Besides death, a pirate's worst fear was becoming disabled. If the injured pirate survived the amputation (see the pirate prosthetic section), and received proper medical attention (which was highly unlikely aboard a pirate ship) he received some sort of primitive substitute for his arm or limb (usually a spare plank, or sometimes nothing at all). For obvious reasons an injured pirate was no longer as effective as an able bodied seamen, and for the most part could no longer carryout his designated duties. Such pirates were compensated for their loss (quite adequately for their times, see illustration below). Actually, most pirate crews organized fairly sophisticated and favorable conditions for injured crew members. Injured pirates were not only compensated financially, but oftentimes they were also offered to do non-physically demanding work on the ship. Such work could include operating cannons, cooking meals, and washing the ship decks. 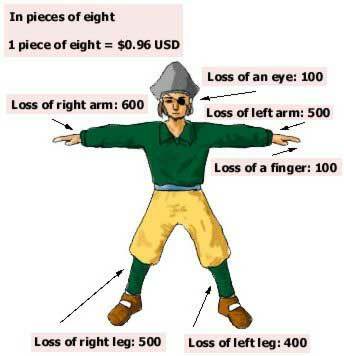 The following diagram outlines what a typical pirate received when s/he lost a limb.